WTI crude prices are in the vicinity of $49.20/b this morning. WTI opened at $48.82/b today, a significant increase of $0.97, or 2.03%, above yesterday’s opening price. Current prices are $49.19/b, $0.34 above yesterday’s closing price. Crude and product prices have strengthened for four consecutive sessions. Diesel opened at $1.5101/gallon this morning. This was an increase of 1.68 cents (1.13%) above yesterday’s opening price. Current prices are $1.5261/gallon, an increase of 1.65 cents from yesterday’s closing price. 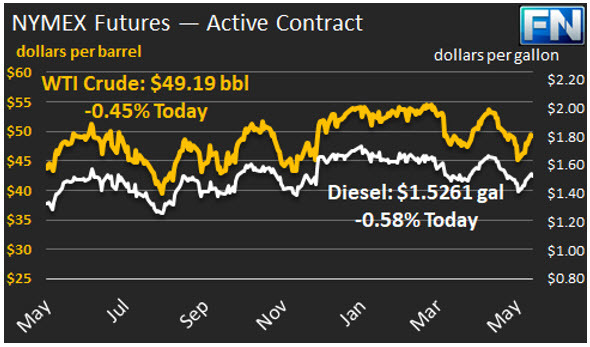 Like crude, diesel prices have opened higher four sessions days in a row. Gasoline opened at $1.596/gallon today, up 1.75 cents, or 1.11%, from yesterday’s opening. Prices are $1.6096/gallon currently, an increase of 1.42 cents above yesterday’s close. Gasoline prices have risen in the last four trading sessions. Yesterday’s prices finished off their highs, but the market nonetheless made significant gains—today’s crude prices opened approximately 2% higher and product prices opened approximately 1.1% higher. 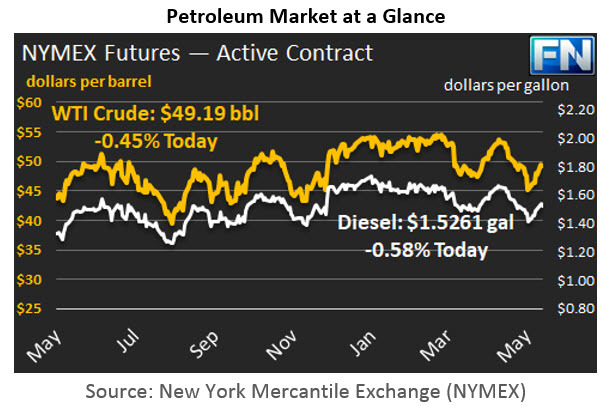 WTI crude prices hit a peak of $49.66/b yesterday, leaving the market to wonder if additional news could be forthcoming that would cause prices to regain the $50/b mark. The possibility of a nine-month extension to the OPEC-NOPEC production cut agreement gave prices a boost. Today’s prices are likely to receive support from the latest International Energy Agency (IEA) Oil Market Report, which reiterated the IEA’s conclusion that oil market rebalancing is essentially here. There is a range of opinion on this, of course, with many investment houses and analysts believing the oversupply will persist into next year. The OPEC-NOPEC cuts have motivated other producers to raise output. U.S. production, for example, rose by another 21 kbpd last week to a total of 9314 kbpd, according to the EIA. From the beginning of the year through the week ended May 5th, U.S. crude production has risen by 368 kbpd. Baker Hughes released its rig count data on Friday, showing another 8 active rigs. Since the beginning of the year, the rig count has risen by 220. The EIA has released data on gasoline and diesel retail prices for the week ended May 15th. At the national level, gasoline retail prices declined slightly by 0.3 cents/gallon. Diesel prices fell more significantly by 2.1 cents/gallon. The crude price slump has been reflected in product markets over the past three weeks, and the current price rally is likely to be reflected in next week’s retail market. Details follow in our second article.